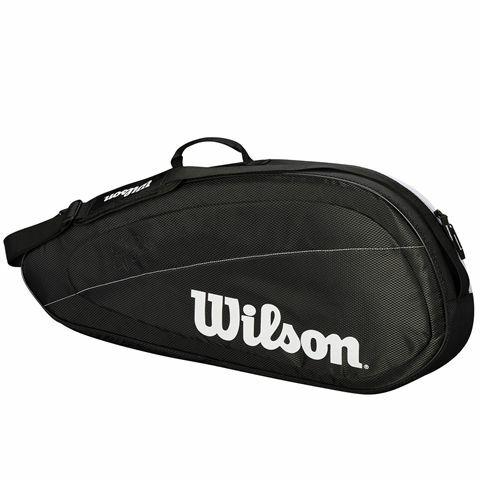 Best suited to players who want to travel light or bring just the essentials to the court, the Wilson Federer Team 3 racket bag is a stylish option with simple styling and a durable fabric construction. It can accommodate up to 3 rackets and has a large main compartment to let you comfortably carry equipment and accessories. Plus, to keep smaller items organized and easy to get to, the bag features a side zipped pocket. It offers Roger Federer’s signature on the front making it perfect as a gift for the Swiss champion’s fans. In addition, easy transportation is ensured by a carry handle and a padded, adjustable shoulder strap. 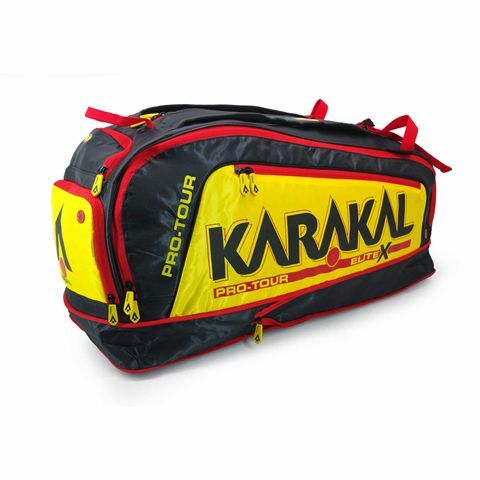 The Karakal Pro Tour Elite X Expandable 12 racket bag is a most capacious choice in the range capable of storing up to twelve frames with a single main compartment. Additionally, it provides an isolated space for shoes with proper ventilation ensured by special breather buttons. 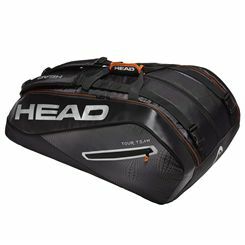 The bag delivers space for all necessary equipment on the court, including a soft-lined pocket for storing goggles. 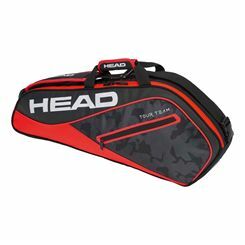 This tournament player bag provides additional space for dirty garment with a wet compartment, and there is a side compartment excellent for additional items, personal belongings, valuables, and playing accessories. The bag is designed with an extremely tear resistant 420D jacquard polyester, and it’s easy to travel with thanks to adjustable, cushioned rucksack straps or a carry handle. 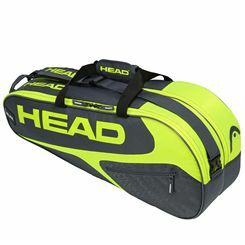 Providing a larger capacity to store a hefty amount of equipment usually owned by serious players, the Head Elite Supercombi 9 racket bag is a two compartment option that can fit up to nine frames and a selection of items required for a proper training session. The bag offers an incredibly distinguishable appearance, as well as an additional capacity for accessories and personal belongings with two large pockets. 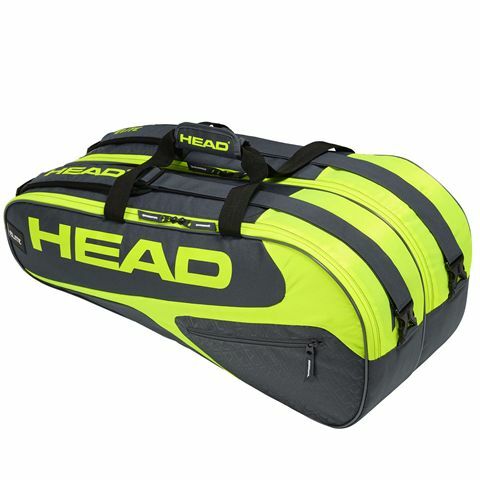 Furthermore, there is the 2-way carry system which offers comfortable commutes on and off the courts either with a shoulder strap or classic backpack straps. 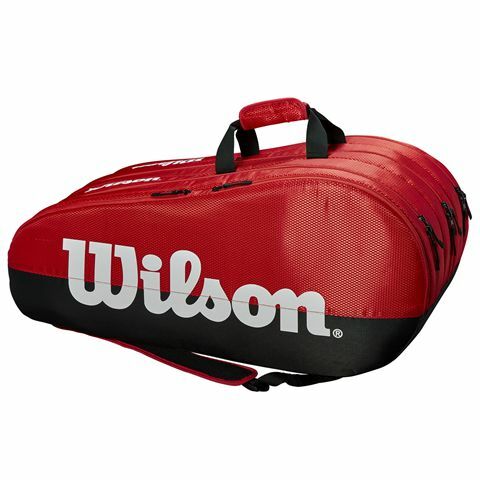 Designed with eye-catching blocked texture, the Wilson Team 15 racket bag provides exceptional amount of space to store essential equipment, garment, towels, and if required – up to fifteen racquet due to three extra-large main compartments. There’s also ample space for accessories, necessities and smaller items required for a successful tennis or squash practice with 2 large exterior pockets. Additionally, one of the main compartments boasts the Thermoguard™ technology to ensure proper protection from extreme temperatures. 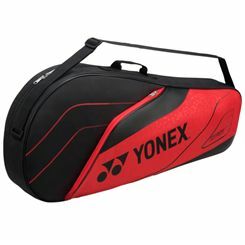 The bag features a carry handle to move it around comfortable, and there is a padded shoulder strap to ensure pleasant on and off the court gateways. Made for players who want plenty of room for their gear without the bulk of a 9-pack, the Head Tour Team Extreme Combi 6 racket bag is a stylish and practical choice with 2 main compartments. The bag can accommodate up to 6 rackets and offers CCT+ climate control technology to keep the equipment safe from extreme temperatures. For easy access to accessories and valuables, there is a side zipped pocket and an inside mesh pocket. Plus, to ensure comfort on the go, the bag features a padded carry handle and an adjustable, detachable shoulder strap. 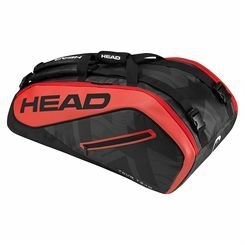 Having the right tennis bag for you and your needs is important, ensuring you’re organised and ready to play, so we’re here to help guide you in your choice. It may sound obvious, but the most important thing to consider when looking for a tennis bag is the size. The size of tennis bag you need depends upon how much space you require to store and carry your tennis gear to sessions or matches. Other considerations will be budget, brand and specific bag features such as backpack straps or thermos pockets. 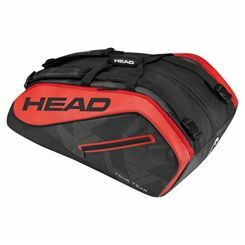 What size tennis bag do I need? 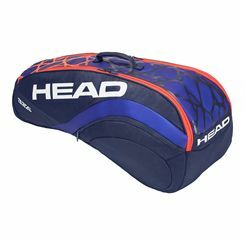 Backpack – great for a single racket, sometimes two, a few balls and accessories and a small amount of clothing. Their advantage is the compact size, ease of carrying on your back and of course their price. 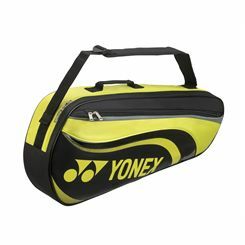 3 racket bag – the smallest size of dedicated racquet bag, you’ll can fit 3 rackets in it or more likely take 1-2 racquets plus some accessories and smaller items such as a t-shirt, balls and a small towel. Again, they won’t break the bank and are light and easily carriable on your shoulder. 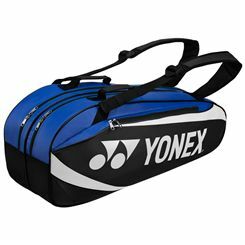 6 racket bag – a very popular option for regular players, combining space with practicality to good effect. 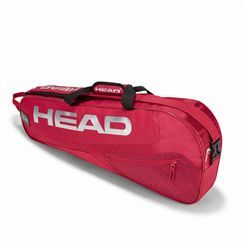 Carry a few rackets in one compartment and clothes, shoes and other gear in the other compartment. 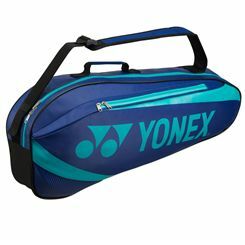 Depending on the model, you can find 6 racquet bags with shoulder straps and a backpack carry system for real ease of carrying. 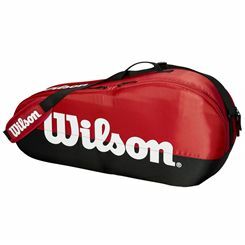 9 racket bag – even more capacity usually with 3 compartments or one small and one extra-large compartment. Usually they will have backpack straps, a shoulder strand and a carry handle as standard. 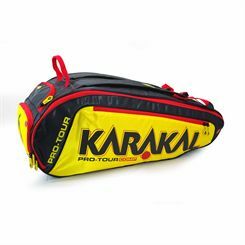 12-15 racket bag – the largest of the lot, these bags will mostly suit those who travel a lot for matches and training sessions. It will take all the gear you need and then some! This should give you a good idea of the type of bag that will be best for you. 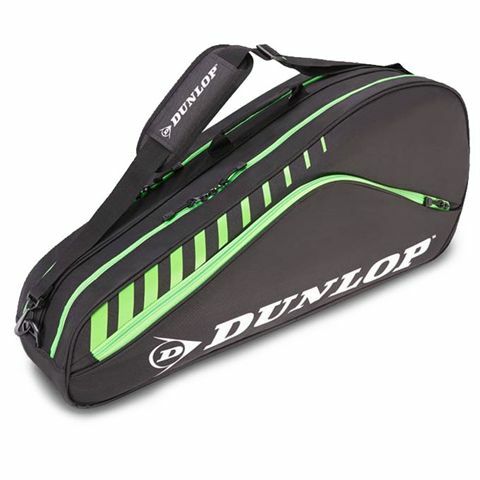 What else should I consider for my racket bag? Other preferences to keep in mind are obviously brand and extra features such as separate footwear pockets, waterproof and wet gear pockets, and climate control linings in compartments. A shoe pocket is great if you play outdoors on grass or clay and want to keep your footwear from dirtying your other gear or damaging your racket. Some of the larger tennis racket bags come with a lining in one of the pockets that helps to protect your rackets from extremes of heat, cold and humidity. This special feature might be referred to as climate control, thermo technology or a thermal lining. 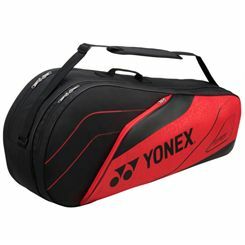 Differences in standard and premium racket bags of similar sizes may be down to a number of details such as the quality and thickness of the materials used for the bag, the zips and the straps and padding, or the number of pockets for accessories or internal sections. Again, it all depends on your usage: if you’re going to be travelling with the bag or prone to treating it a bit roughly it’s probably worth investing in a higher quality option that’s a bit tougher and more durable. To narrow down the search results you can use the filters on this page. Sort the results by bag type and size and you can also select brand too. This will help you see more relevant bags for you. 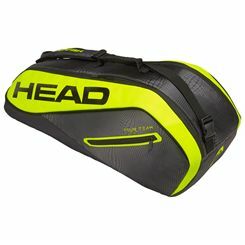 Here at Sweatband.com you'll find a superb range of tennis bags and racket bags from all the top brands including Head, Wilson, Prince, Dunlop, Tecnifibre and more. Available at discounted prices with fast delivery and friendly service.